Another one is for bird lovers - a beautiful handmade Rajasthani minakari necklace with birds painted on it! The necklace consists of a pretty minakari pendant on an adjustable bead necklace. 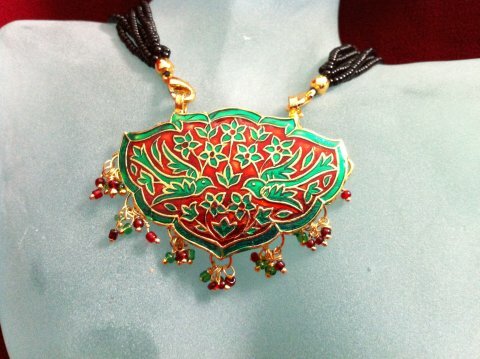 The green and black pendant has two birds hand-painted on it. The length of the necklace is adjustable. Optional stud earrings with a bird hand-painted on each one.